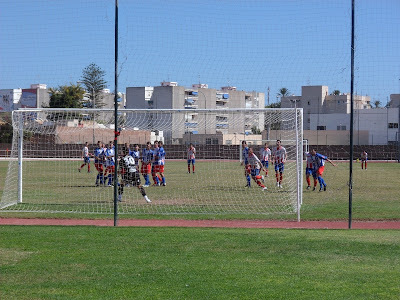 European Football Weekends: European Football Weekends goes to Spain. Again. The food wasn’t burger and chips. Sitting outside the Estadio Manuel Martinez Valero, scene of Hungary’s 10-1 destruction of El Salvador during the 1982 World Cup, we were almost alone. Two guys sat drinking coffee at the next table. We had ordered a round of beers and received snacks to accompany the drink. Squid? At football? Go on then. A mouthful later and we had all cast it to one side. It was an hour before kick-off and Numancia were in town to take on Elche in Liga Adelante, the Spanish Second Division. A pocket of sullen looking teenagers walked past; five lads giving ‘their’ walk and girl, wearing an Elche top and tiny shorts. Other than that, there was little to give away that there was a game in town and about to kick-off shortly. We took up three of the 36,017 seats available; 8,216 other fans joined us. After 30 minutes, a group of fans to our right, banners proclaiming them as the Ultras, started up a series of chants that would last for the remainder of the game. Teens postured and shouted sporadically; girls tried to catch the eyes of lads; Numancia were awful yet still claimed a 2-2 draw which, in truth, was more about the inability of the Elche forward line to strike a shot on target despite being lined up all game as though they were on a driving range. As the final whistle sounded, a solitary Numancia fan wandered to the front of the stand, hung a banner over the front, and congratulated her team. The Elche fans, in a state of disbelieve that they couldn’t get all three points, plodded through the discarded sunflower seed kernels and left. The pub afterwards, still at the stadium, had more atmosphere. And there were only 8 of us in. 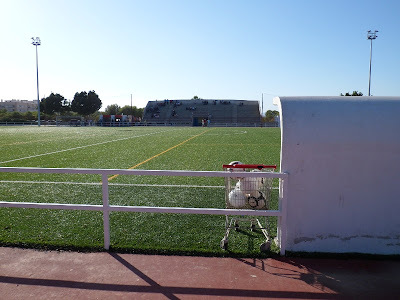 If Elche, who lost out on playing in La Liga this season on away goals, was a disappointment then Santa Pola CF was going to make up for it….and then some. It was 11am on Sunday morning; the sweat poured off me, in part due to the heat and possibly due to the excessive alcohol intake during the previous week. Thirty minutes until kick-off and enough time for a few cheeky beers. Luckily, the first thing you see when you walk into the ground is the bar. I was drawn towards it, along with almost all of the crowd. As the players finished their warm-up on the pitch, a guy with a drum wandered across the halfway line, followed by a group of his mates. The players moved to one side. 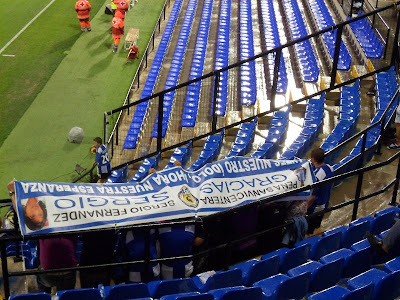 As CD Alcoyano ‘B’ kicked-off, the group of Santa Pola fans were standing on the terracing, banging their drums and blowing their horns; they kept this up for the entire game. I grabbed another beer, took off my top (ladies, I know…I should’ve given warning of this) and watched four goals shared between the two teams; a last minute equaliser for Santa Pola clinching their point in this Regional Preferente de la Comunidad Valenciana clash (the fifth tier of Spanish football). As the drumming eventually stopped, I made a dash out to catch the bus to nearby El Altet. After spending ages hunting for fixture lists and relying on Google translate, I had found a game being played in a league two levels below Santa Pola. El Altet, in the shadows of Alicante airport, was a ghost town. For the whole of the previous week they had been celebrating their fiesta, and while I was watching Elche the previous evening, the townsfolk were drinking far too much alcohol and setting off huge fireworks. 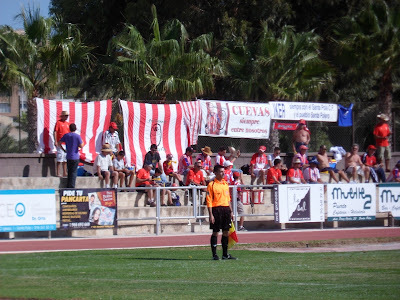 Their local team, CD Altet were hosting newly formed CF Union Deportiva Ilicitana at the Campo Municipal El Altet. Now a short history lesson: on the other side of the airport is a town called Torrellano. 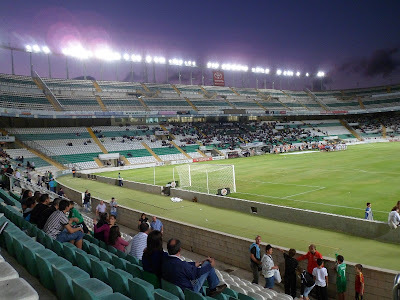 Their team merged CD Illice in 2009 to create Torrellano Illice Elche Parque Empresarial CF and then joined up with their big-boy neighbours, Elche CF. 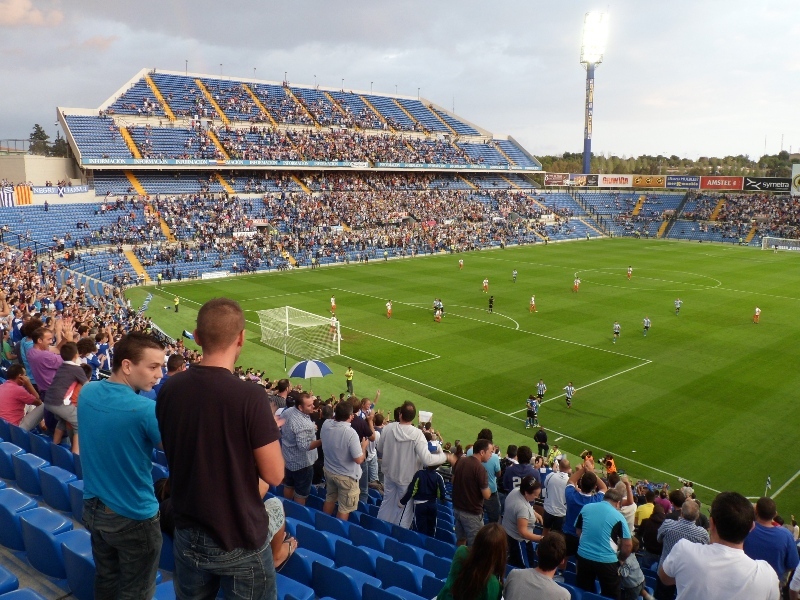 They won promotion to the Segunda Division B (the Spanish fourth division) and were then promptly bought by a businessman who moved the club to Valencia and changed their name to Huracan Valencia CF. 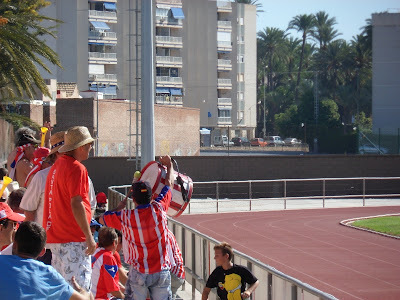 In their place came CF Union Deportiva Ilicitana n Elche. Meanwhile, a new team was set up in Torrellano. Anyway, back to girls. I mean footballs. A great big shopping trolley full of footballs on the touchline is enough to warm even the coldest of hearts. And that’s what you get at El Altet; you keep your fancy ball sacks. 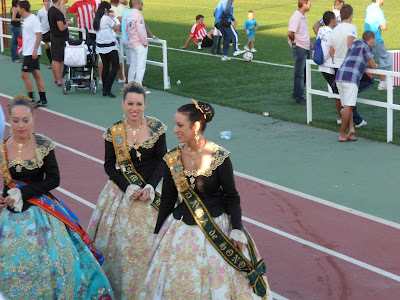 Before kick-off, there was an extended walk-on/walk-off by three girls who obviously had something to do with the fiesta, considering the sashes they wore. A small ‘cantina’ was selling bucketloads of Cruzcampo and when I wasn’t at the bar, the local fans were all buying coffee. 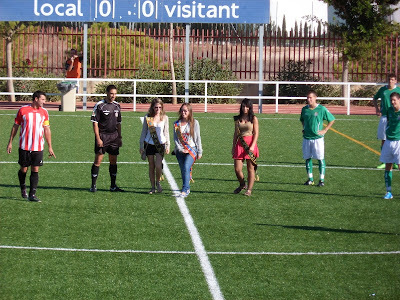 The visitors cantered to a 5-0 victory and were then presented with a trophy by the Dama de Honor. I wonder if that happens after every CD Altet; if so, then I’m buying a season ticket. The trophy wasn’t so bad looking. There was one match to go during my Spanish sojourn and this was the BIG one. 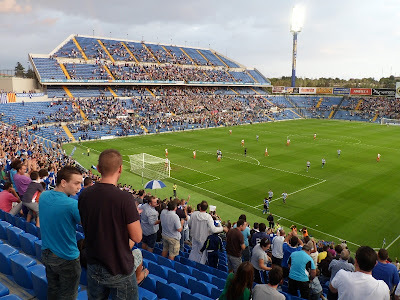 This was the Alicante derby (no, not this one) between Hercules and CD Alcoyano, based in Alcoy which is 37 miles away from Alicante. This would be it: blood; sweat; tears; a huge crowd; away supporters. The bars were packed close to the Estadio Jose Rico Perez. I flicked through Marca while sitting at the bar, doing my best to look like a local; until people started speaking Spanish to me. Entering the stadium, it was obvious where the Spanish fans were during the European Qualifier held there the previous Tuesday. Discarded sunflower seed kernels were splattered in front of many of the seats while a number of seats, presumably where Scotland fans had been in the home end, were clean. The stadium was spruced up and other than the kernels, everything was clean. 95 away fans had made the long journey south-west (I counted them after taking a picture of the away end) but with their tickets being 20 euros and equivalent seats in the home end being 12 euros then I’m sure some of the sensible ones took advantage of the cheap tickets. The game kicked-off with a pocket of Hercules fans behind each goal all going crazy and urging their team to victory. After a goalless first half, it was the home side who took the lead a minute after the restart. With a decent atmosphere building inside the stadium, it was almost as if Zeus, the god of sky and thunder and thunder in Greek mythology and father of the demigod Hercules, interpreted the support as some kind of rain dance the sky suddenly burst open with rain. With only two areas of cover in the stadium, and that being limited to just a few rows of seats on either side of the ground, fans hurried up each of the two bigger stands. Those sitting behind each goal tried to endure the soaking for a minute or two and then many started dashing down the seats and taking cover in the concourse under the stand. The brave souls who remained in their seats took shelter under banners, fashioned headwear from carrier bags or simply took no notice. And what of me? Pah…rain will never deter me from watching football. Despite being reduced to ten men, the home side held on to their 1-0 lead to remain top of Liga Adelante as they look to make an immediate return to La Liga. After the match, I made an immediate return back to my Santa Pola digs, via the pub when I got off the bus. Spanish football: it’s bloody great once you get past the squid. Read more of Hudson's travels on Gannin' Away and on his all-singing, all-dancing Swedish football website HERE. great job. a truly interesting work. i have a question that is Segunda DIvision B really the fourth tier? Is it not after Segunda Sivision and above the tricera division. Well spotted, Owais. The Segunda Division B is actually the third highest level in the Spanish football league system. I think our correspondent was still feeling the after effects of that squid when he penned this article. That and the beer.